Well, my three day mini-holiday came and went at the speed of light (299, 792, 458 m/s) which is measured in meters per second for those of you who did not know what m/s stood for. We had a great time and did a lot of walking. It was good exercise and often put Marshall to sleep...whoo hoo! We rode the Incline Railway on Friday which is the steepest of its type in the world. Going up, you ride backward and I must admit feeling a little squeamish and having to turn around and face the direction we were going. Going up and coming down I could not get this horrible image out of my mind....What would happen if the cable broke? I know that is a horrible thought but I promise you I am not the only one who has ever had it pop in their heads. Saturday we went to the Children's Discovery Museum. Michael is just about too old for it so I think this will be the last year he will be interested. Marshall, on the other hand, had a great time. 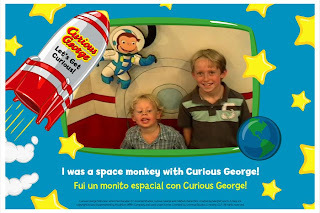 The 2nd floor of the museum changes it's theme every few months and the theme this time was Curious George. We thought that was apropos considering Marshall is a monkey that always gets into trouble! Sound familiar. Now, if I could only get Mike to wear a yellow, 10 gallon cowboy hat! Sunday we went to the Aquarium which is a lot nicer if you have a two year old in a stroller not free lancing it all through the place. Once again, the kids were only partially interested. How could a bunch of cool fish, penguins, crabs, jellyfish, etc. etc... not be cool for a kid? Kids today are so hard to please. I remember being happy with 5 TV channels and playing Space Invaders on my Atari! Amazing what a few/several decades will do! Here are a few pics from the trip. The remainder will be put on Facebook since it is easier to look through them (and bigger pictures). I love Chattanooga. I miss it. Looks like you had a lot of fun. We haven't been to the discovery museum. Maybe we'll go when we are in town next.